Wonderful find. I have been on the Gulf 2000 Initiative website before but never browsed through the map. It would be amazing if such a map included Pakistan, the former USSR Stans, Azerbaijan and North Africa. The only problem I see is that unfortunately Alevism has been grouped with Shiite Islam. Gulf2000 map archives include many on Pakistan, the former Soviet Union (Caucasus and Central Asian “Stans”). All one needs is interest and an hour of time to browse through there and get fascinated. 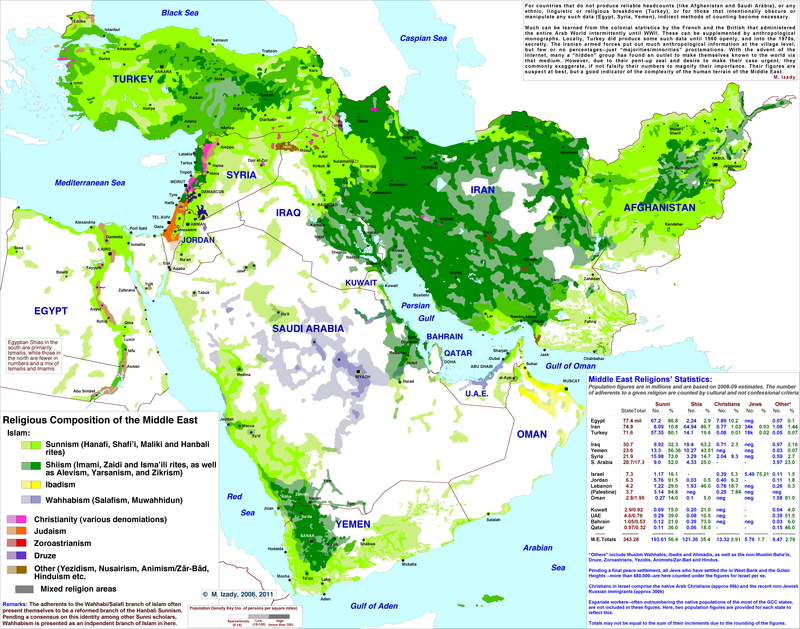 I realize that they just posted maps on the Levant in there, to include Syria! Definitely worth browsing there. Excellent map for high level reference. I’m glad that a distinction has been made between Sunnism and Wahasbism. The map has lots of mistakes. For example, Qatar is shown as to have majority shiite which not true, also Abdu dhabi and Dubai are not wahabbis, and many others.